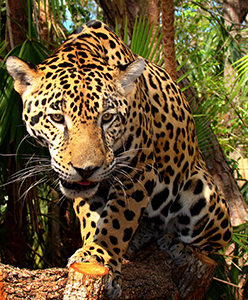 Jaguars are one of the biggest hunters that live in the rainforest. These predators eat a variety of smaller animals, including armadillos, monkeys and deer. Jaguars kill their prey by creeping up on them and using their sharp teeth to bite through the prey's skull. While jaguars use their claws to hunt, they also use them to climb. When they do not need their claws, they retract them inside of their paws. Jaguars are also known for their fur, which is colored with shapes similar in color to shadows of the forest floor. This helps them camouflage with their surroundings. Jaguars are also unique because of how they reproduce and raise their young. Female jaguars give birth after 13 weeks of gestation. Cubs stay with their mother in their dens for six months. Then, they stay around her for up to two years while they practice their hunting skills. Following this two-year period, cubs leave to find their own territory. Jaguars are strong and interesting animals who can live up to 15 years. Humans are their only threat.